First, you need to know that reservations at Be Our Guest Restaurant can fill up super fast, so you need to book the dining time you want the full 180 days in advance. 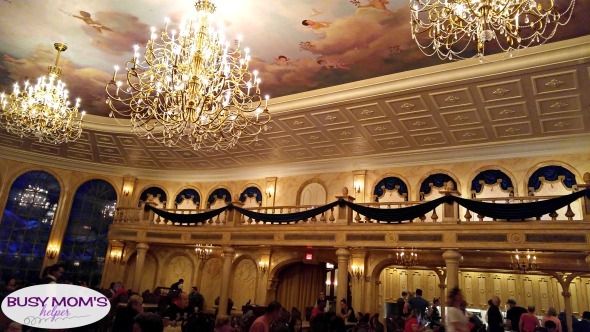 It’s one of the most popular dining venues at Magic Kingdom – if not all Walt Disney World! There MIGHT be a few last cancellations/openings as it gets closer, but don’t rely on that if it’s your dream to eat here. If you’re doing breakfast, I highly recommend getting the earliest time you can because then you get to enter the park before everyone else to make it to the back of the park for your meal. Pictures in front of the castle without a big crowd – bonus! There’s a stand to the side of the entrance where you check in, by a tiny rolling stream. Then you go enter the large castle doors, complete with lion statues and beautiful glass window above featuring the famous rose. At the kiosk, it explains that you can use your MagicBand to order, or get a magic ‘rose’ disk to take to your table. Once you place your order with one of the friendly cast members, you go choose your own table in one of the three rooms (more on them below). They ‘magically’ find your table with your food! Really, they find your band or rose. The drinks for breakfast and lunch are self-serve, so you can go get those filled while you wait for your food to be delivered. They come pushed in fun little carts, too! This guy was gracious enough to pose for a photo with our cart. Every table gets the pastry tray to share – it includes little rolls and tasty pastries. Nothing spectacular, but they were okay. The menu is a little different, with foods that may not appeal to some. In case you’re for more ‘regular’ food, they told me it was perfectly fine for adults to order off the kids menu. You can check out the menu HERE. I got the Assorted Cured Meats and Cheese – it was good, but again not extremely great. I couldn’t resist also ordering off the kids menu, and got the Crepes de Cogsworth – these were REALLY good and fresh, and that wildberry foam is phenomenal! It was a good portion for a child meal. My mom ordered the Feast a la Gaston, and said it was good. It’s a lot of food, so that’s a definite bonus! Grand Ballroom: I know I’m weird, but when we walked into the grand ballroom and I felt like I was transported right into the movie, I got giddy like a little school girl! Seriously, it was a dream come true and a major highlight of my trip – I was enough of a dork to even get tears in my eyes. It was BEAUTIFUL! I was told the babies on the ceiling were actually from baby pictures of the designers – what a fun little memento! It was bright in this room, and out the far window was a lovely ‘night’ scenery like you were really looking out at the forest surrounding the beast’s castle. My absolute FAVORITE room! West Wing: Of course you HAVE to walk around the West Wing (if you don’t choose to eat there) and check out the incredible details. From the torn, draping curtains all over, to the slashed photo of the Prince, to the glowing, magical rose in the corner – it’s an incredible room! There was a ‘fireplace’, and glowing candles in this more dark room, still setting a really neat atmosphere. It was less crowded and noisy in there as far as people eating their breakfast, although lots of people kept walking through to see the rose. Rose Gallery: What’s more amazing than a HUGE music box of Belle and the Beast dancing? This was a neat third room, and a bit quieter than the grand ballroom. I liked walking around in there seeing the different artwork of scenes from the film, and of course seeing the Belle and Beast twirl in the center of the room. Needless to say, this was an amazing experience both with dining AND with feeling like I was in my favorite Disney movie. If you can nab a reservation, I HIGHLY recommend eating at Be Our Guest Restaurant for breakfast! Promo Code: BusyMomsHelper for even more savings!